Tomorrow, October 25, is the feast day of Saints Crispin and Crispian, and consequently the 599th anniversary of the Battle of Agincourt, where Henry V's ragtag bunch of brave, marauding Englishman defeated a vastly superior French army. To celebrate, I've got not one, not two, but three different things to share with you! First of all, a comic. As I've mentioned before, Laurence Olivier's 1944 film version of Henry V was what first sparked my present-day infatuation with Shakespeare. My father introduced me to it when I was about nine years old, but his own association with that particular movie goes back much further. Apparently my grandfather thought the entire escapade was hilarious, and said it was "the greatest movie he almost saw". It was the only time either he or my father were ever thrown out of a movie theatre. 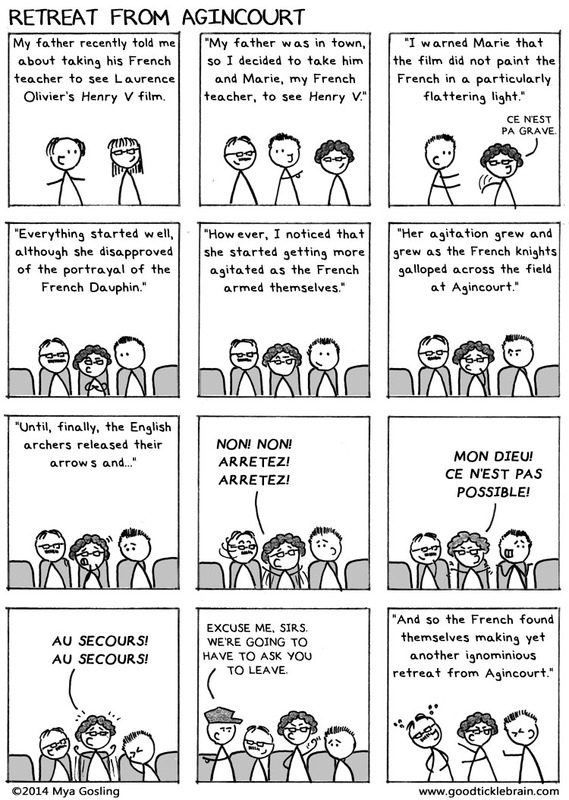 The only reason anyone still mentions Crispin's Day today, of course, is because Shakespeare wrote a whopping great speech all about it, in which Henry psyches up his men before the big battle of Agincourt. It's a fantastic speech, and probably one of the first bits of Shakespeare that I memorized from start to finish. Here's a video mash-up of six different Henrys giving six different renditions of the Crispin's Day speech. I'm running through them in chronological order, and each of them gets one verse line at a time. And so, without further ado, here are Laurence Olivier, Robert Hardy, David Gwillim, Kenneth Branagh, Jamie Parker and Tom Hiddleston! If you want to see the full versions of some of these speeches, check out my Crispin's Day post from last year. Finally, here's a look at how depictions of Henry V's hair in popular culture have evolved over the past 70 years. Now, I'm not saying this is a bad thing, but we have moved further and further away from the historical source material. Just an observation. Happy Crispin's Day (tomorrow) to everyone!